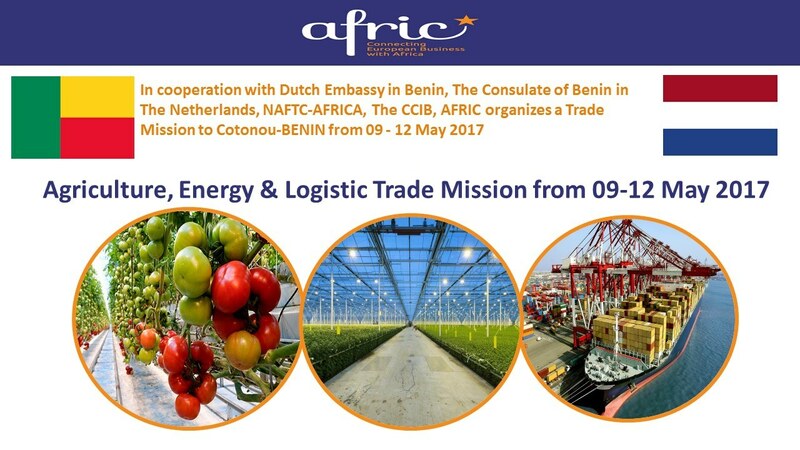 In cooperation with Dutch Embassy in Benin, The Consulate of Benin in The Netherlands, NAFTC-AFRICA, CCIB and CCIT, AFRIC is organizing an European Trade Mission for the Top Sector such as ‘’Agriculture, Water, Energy & Logistic to Benin, from 09 to 12 May 2017 in Cotonou. This trade mission aims to promote trade between The Netherlands, Benin and Togo by bringing together relevant stakeholders and exposing them to the business opportunities. In the presence of politicians, private sector representatives and international organizations, conferences and round tables will be organized. Several themes will be addressed in a warm and relaxed atmosphere. They will enable the delegation from the Netherlands to meet the set of actors of Beninese and Togolese agricultural sector. You will benefit from interventions of politicians, economists, businessmen and personalities who have already managed to settle their presence in African continent, or in above mentioned countries. Tailor made B2B Mach-making sessions will be organized on the second day of the trade mission. This business trip will allow you to understand the Beninese and Togolese business environment, to sign business agreements both public and private, find distributors or to settle the foundations for a future partnership. Since the transition to democratic government in 1991, Benin has undergone a remarkable economic recovery. A large injection of external investment from both private and public sources has alleviated the economic difficulties of the early 1990s, caused by global recession and persistently low commodity prices (although the latter continues to affect the economy). Benin, poor in natural resources, is traditionally a trading nation and its economy is heavily dependent on the success of its much larger neighbour, Nigeria. Benin is hugely dependent on its import/export trade with the latter. A large part of the economy is based on the re-export of goods to Nigeria. Benin’s economy is principally agricultural – it is self-sufficient in basic foodstuffs, the main export commodities being cotton, peanuts, coffee and palm oil. The manufacturing sector is confined to some light industry, mainly involved in processing primary products and the production of consumer goods. A planned joint hydroelectric project with neighbouring Togo is intended to reduce Benin’s dependence on imported energy (mostly from Ghana), which currently accounts for a significant proportion of the country’s imports. The service sector has grown quickly, stimulated by economic liberalisation and fiscal reform. Membership of the CFA Franc Zone offers reasonable currency stability, as well as access to French economic support. 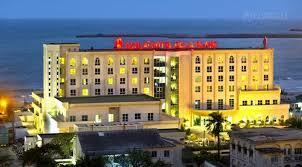 Benin is also a member of the West African economic community ECOWAS. The economy remains fragile and largely dependent on international aid. Main exports: Cotton, peanuts, coffee and palm oil. Togo has worked hard since 2007 to boost its economy and build the foundation for the solid growth which has been among the most significant seen in the region. This relaunch of the economy has helped to reposition Togo as a dynamic player in the region and seen it achieve some significant initial economic success, thereby earning the confidence of international investors. Lomé is home to the headquarters of regional airline Asky, pan-African bank Ecobank, and the Lomé Autonomous Port, the only port on the West African coast from which you can get to several capitals in one day. Using the Port of Lomé therefore for the carriage of goods means benefiting from very competitive timelines and costs. With their strong pro-business approach, the Togolese authorities have instituted reforms, including the introduction of a new investment code; they have improved the ease of doing business, joined the Extractive Industries Transparency Initiative and set up a commercial court. The country’s economy is dominated by commercial and subsistence farming. Food and cash crop production accounts for 47 % of GDP, providing work for 65 % of the population. The mining industry is one of Togo’s most promising economic sectors, with the country being the world’s fourth largest phosphate producer. Its estimated 60 million metric tons of reserves have potential to give this industry a boost. Official welcome word by Dutch ambassador in Benin. Official opening by Beninese Minister of Water & Energy. Presentation of Dutch delegation (each Dutch company gets 5-10 minutes to present itself to the audience). Seminar “How to do business in Benin” by the chamber of commerce. Presentation of Beninese business opportunities in various sectors. by Dutch Embassy in Benin. For who? For European and particularly Dutch companies actives in Agriculture, Water, Energy & Logistic industry. However it’s open for all entrepreneurs who are interested in doing business in Togo and Benin. including: Collectives local transport, matchmaking, seminars, sites visits, reception, Local assistance by the organization. 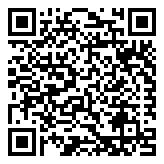 You can use a Trade Mission Voucher to cover up to EUR 1.500,- of the participation fee for this mission. Organisation AFRIC in collaboration with Dutch, Beninese and Togolese Government. All hotel offers shuttle services however our staff will receive you at the Airport. ©2018 Afric-EU.com, All rights reserved.